Imagine you are miles from home and you suddenly realise you have forgotten to send an important document stored on your computer. What can you do? It is an increasing problem because we are now far more dependent on our computers than ever before - in fact a lot of us can't do our jobs or even live our lives without our PC. In pre-worldwide web times, sharing information remotely was close to a black art. Networking was in its infancy and we used floppy disks to transfer most of our data - at that time swapping files between computers was something you did with both PCs in the same room. 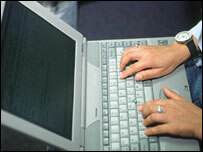 One of the first types of remote access was called Laplink. It enabled you to plug two computers into each other with a serial lead. It was like plugging into a modem or a printer. You could look at the files on the other computer and move them across. It was essentially a transfer facility and not much more than that. Laplink is one of the few products that has ridden the technology wave and managed to survive the transition from MS DOS to Windows XP. Now it is the internet that has been pressed into service to make our life easier. Today there are a host of services that allow you to go online and connect to a computer far away. We're going to start to get good internet bandwidth and infrastructure everywhere we go, because we won't be able to work without it. One of them is LogMeIn which allows you to access your computer from any web browser anywhere in the world. It creates a virtual desktop that you can access, display and use in a web browser. Your remote computer contacts your home computer, wakes it up and promptly takes it over. The remote machine completely controls the home machine, but the only information being sent across the internet is the mouse keyboard and screen data. This also means you can use any of the applications already on your home computer, remotely. Michael Simons of LogMeIn says: "You may have a contract on a USB stick, you're in an airport lounge and it doesn't have Microsoft Word but you have it on your home or office computer. "With our product you can simply plug the USB stick into the computer you're sitting at and then use Word on the remote machine." You view the data on the home computer until you are finished and then you break the connection - the only downside is that your home computer is still connected to the internet. For some people this creates security worries. Rupert Goodwins, Technology Editor of ZDNet UK says: "If you're going to have to access your computer remotely then that computer has to be there all the time. "So the internet's on, the computer's on - there's a way into your computer. It's got security, so it's not an open door, but if you do not set it up properly it can be quite a security gap. Microsoft built remote access into Windows XP. It will also be part of Vista and the forthcoming version of Mac OS X for Apple users. Mr Goodwins says once people start using remote access it becomes addictive. "We're going to start to get good internet bandwidth and infrastructure everywhere we go, because we won't be able to work without it. "So if we go to places that don't have internet infrastructure they'll suddenly be provided with all the things we've got access to, so our own revolution will push the revolution elsewhere. This could be one of the big things that breaks down the digital divide."